Crystals written by Nancy Weshkoff | Moonflower Yoga Inc.
About a year ago, I attended a crystals workshop and have been hooked on crystals ever since then. You will find yourself drawn to these wonderful gifts from the earth. Many crystals have been used for centuries for their healing powers. But what exactly are these crystals? Simply put, a crystal is a solid stone that was created when the earth was formed, and crystals have continued to change and develop as the earth changes and develops. Some crystals developed in deep underground chambers or from the fiery gases of the earth. They come in different geometric formations and a beautiful variety of colors. Crystals can be shaped and polished and make excellent jewelry. But they should also be appreciated in their rawer, non-polished state. 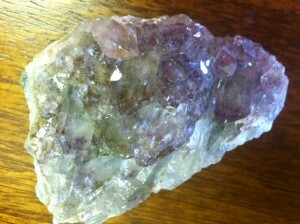 Amethyst, citrine, rose quartz, amber, and jasper are just a few examples of crystals. Each crystal can help you in a different way. Clear quartz, for example, has many wonderful properties including the ability to aid concentration and help with problem solving. One of my dear friends was having difficulty with an elaborate Excel formula. After spending a few minutes with a clear quartz crystal, he was able to return to the formula and determine what was causing the issue. When I feel stressed or high strung, I use my favorite black tourmaline to help ground me. During meditation and in restorative classes, I often bring crystals into the room to facilitate good energy. It is because of the ways that crystals can help you that I wanted to make more people aware of crystals. Moonflower Yoga is proud to be hosting its own Crystals Workshop this Friday evening, June 14th, from 7-9 PM. During this workshop, participants will learn more about the history of crystals, and each person will be given for free a basic crystal stone to keep for their personal use. The workshop will also include a meditation using crystals. If you are in the area of Bellmore, in Nassau County, Long Island, New York, please join us at the Moonflower Yoga studio for this wonderful Crystals workshop. You will be amazed at the history of crystals, and you will receive your own crystal stone to bring you positive energy. And stay tuned for more information on future workshops at Moonflower Yoga, as well as information on our great yoga classes!